Good ol “Pa” and Nell Newman, we love you! Newman’s company has given over 200 million dollars to charities worldwide since 1982. The profits from their delicious snacks and yummy chocolates (hellooo caramel cups!! 🙂 )is dedicated toward making the world a better place. So you really can feel good about eating their products (even if you “accidentally” overindulge in a whole chocolate bar…whoops!…it was for a good cause!!). So onto the review. 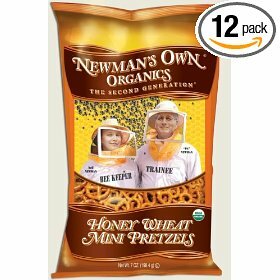 Honey Wheat Mini Pretzels. Now, i’m not a pretzel person really. I find them usually unsatisfying and too salty. But something caused me to grab these in a snack rut, and i sure am glad I did. Before i start, i must say the package is adorable. It has Nell and Pa on the front as bee keepers. Cute! The pretzels are about the size of your average snack-sized mini pretzel, and in the typical shape (not circles, sticks or nuggets). The pretzels have a nice honey taste to them, and are slightly sweet. You can mostly taste the sweetness after you swallow the pretzel, so it leaves a nice aftertaste. They were nice and crunchy, and had a fresh, clean taste to them. No burnt flavor like some pretzels have. They were salty, too, but it went well with the sweet. Surprisingly, there was only 180mg of sodium per serving, which isn’t a lot for a packaged pretzel. I’ve seen as much as 400mg per serving! Hellloooooo bloating! I had 2 bowls of these, one bowl with a root beer Zevia (awesome combo), and the 2nd bowl with a Zensoy chocolate pudding (also an awesome combo). 1 serving (20 pretzels) is 110 calories, 1 gram of fat, 22 carbohydrates, 3 grams of fiber and 2 grams of protein. Organic Unbleached Wheat Flour, Organic Whole Wheat Flour, Organic Honey, Organic Sugar, Organic Sunflower Oil, Salt, Yeast and Soda.